I think after 4 weekends in a row I am retreated out! My waistline agrees with me! I did make headway on a couple projects though. I thought I would be able to catch up on store business but the fabric reps are making their after market rounds. So, I guess I get to order fabric instead! The weather has turned cold and rainy/snowy. It seems like the perfect sewing weather, oh and hunting too. Loren has filled both his deer and elk tag so it looks like we will get to go to Billings for Thanksgiving. I know this makes my daughter happy. I see she even made a new pinterest board: Thanksgiving Dinner. That's enthusiastic!! She is taking hostessing dinner very seriously. I think my part will only consist of making a couple pies. I can do that! It has been a long time since I have gotten to spend Thanksgiving with my parents. Family time is the best time! 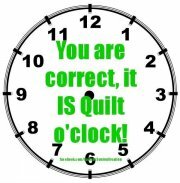 We have been getting a few challenge quilts turned in already! Our "Crazy for Fall" Gathering Day will be on Friday November 20th from 1:00 - 3:00! Join us for gingerbread, hot cider, and coffee. Entries can be brought that day. "Seeley Lake Canoe Trail", our Row by Row kit, is available now to purchase for $12.00. Limited to kits on hand! Click here to order yours! License plates are also available for $5.00. Looking for something productive to work on this winter? Our BOM's are mailed out the first week of each month. Call to get your name on a list! This is a 6 month BOM designed by Vicki Bellino from Bloom Creek. Faye Burgos has designed another wonderful fabric line using her Strip-It pre-printed stripe and beautiful coordinates. Cute feather tree! Make it as a BOM or get the complete kit and have it done for this Christmas. $22.00/month. and we love the fabrics by Timeless Treasure. The color scheme is blues/reds/golds/greens on creamy backgrounds. This is a 6 month BOM. 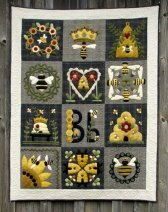 Triangles on a roll are available for $12 and can be sent with your first kit, along with block background and wool applique. A thread pack with 14 Valdani pearl cottons is also available for $68. We find hand stitching to be very therapeutic for the soul, even more so with friends! If you think so too, join us on the 2nd Friday of each month and bring whatever hand work you are working on whether it is a wool project or simply have a quilt to bind. No skill is required. We can all share ideas and techniques and learn from each other! Class at 10:00. LaRee is super excited about how quick and easy it is to make this runner with the binding tool. 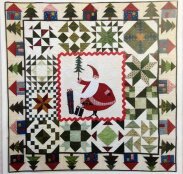 The star pattern is the current issue of the Block magazine from Missouri Star which we carry. LaRee modified it to make this runner. The runner is a perfect beginner project and uses 2 1/2" strips. 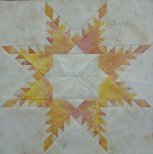 You can make the star quilt if you are in the mood for a larger project. Class at 11:00. All you need is your favorite jelly roll and the Strip Tube Ruler to make a quick quilt-in-a-day! Sarina will show you how fast it is to cut your blocks using the ruler. You will be able to explore the many patterns you can make with the Strip Tube Ruler. Class at 10:00. Bring any project that Toni has taught and she will guide you through finishing it up! Haven't taken a class from Toni yet...not a problem! She will help you get started with her innovative method of foundation piecing. You can choose from many patterns including: Dear Jane, Civil War Diaries, Roaring Twenties (books required) and Toni's patterns: Ghost Stars, Under the Big Sky, Desert Stars, and Broken Tiles. Call ahead so she can have the material on hand otherwise no sign up needed--just show up between 10am & 2pm and Toni will be on hand. We will be closed Thanksgiving day!